A couple years ago, I bought some outdoor furniture off Craig’s List from the sweetest, young mother. We shared a cordial conversation about making over furniture as she gathered the chairs from her storage shed. I held her adorable baby girl for her and tried not to come to tears. She was a brown haired cutie, wearing a little romper and blue jean hat, just like our little Emily so many years ago. Anyway, a week or so after the encounter, she sent me an email through my blog saying she wanted to give me a roll of wallpaper! I think we ended up making a trade, but for the life of me I can’t tell you what I gave her. 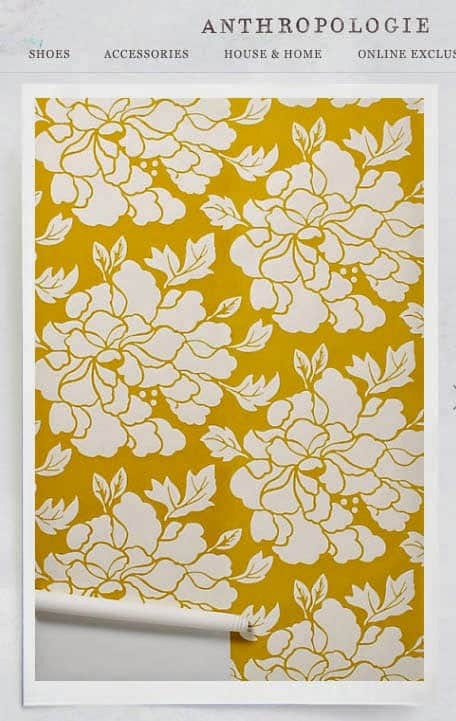 Anyway, she gave me a roll of Paeonia wallpaper from Anthropologie! I wasn’t really sure what I would do with it, but I knew I loved it! Fast forward to this spring, when we bought our house in Birmingham. I was hoping I’d find a place to use this gorgeous wallpaper! I decided it was the perfect design solution for this slightly dreary, guest bathroom in our basement. Here is the before photo. 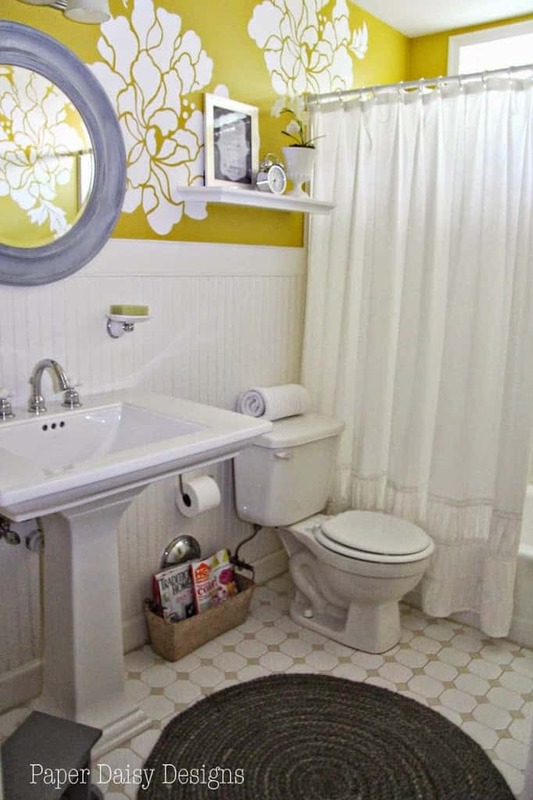 While this bathroom is in our basement, it does get just a smidge of natural light from the window above the tub. 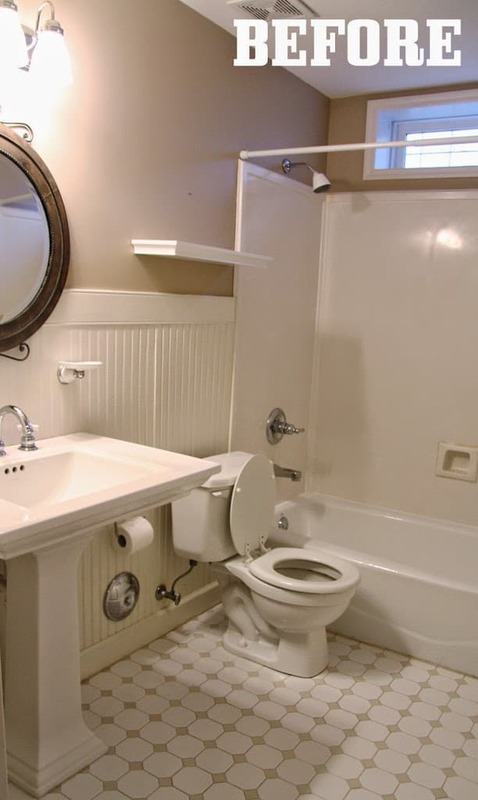 As you can see from the photo, the bathroom, like the rest of the house, already had a bit of charm. It just needed an infusion of happiness and light. Did you notice yet that there are fewer flowers here than in the image of the wallpaper? It turned out that my “fantastic idea” was not with out flaws. Beyond hanging the dreaded wallpaper border back in the nineties, which honestly we really should forget, I had zero wallpaper experience. Being the math adverse person I am I had not even measured to see if I had enough wallpaper. Not until after I had enlisted my neighbor to help me, did I figured out that I might have just enough to paper one wall. However, I realized the flowers were so impactful that cutting out each flower and pasting them to the wall would give me the look I was hoping for. I think results are perfect for the space. 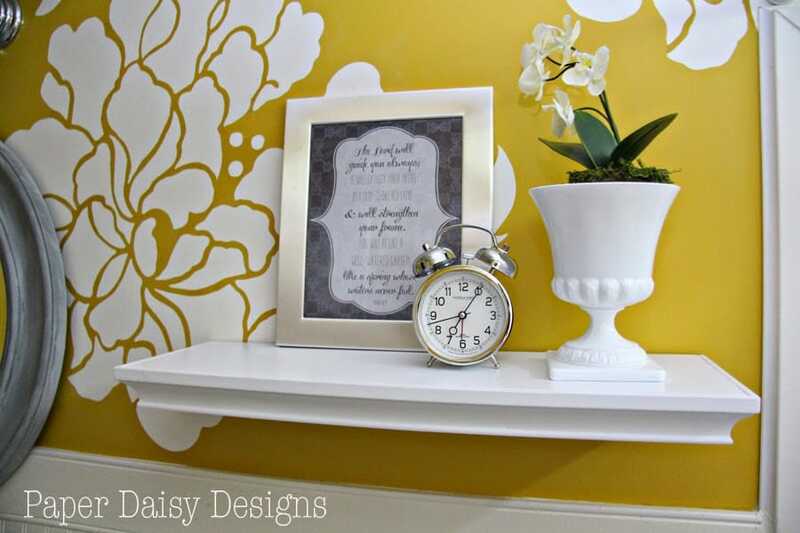 There’s more room for the deep yellow wall color to fill the space with sunshine. I replaced the mirror with a more simplified version and brought in a small side table that had already had many reincarnations. Each piece received their own little paint makeovers to coordinate in the room. Then, just a few accessories added to the floating shelf, towels and a rug were all the room needed. I’ll share in another post how we pasted the flowers to the wall and spread this one, partial roll of wallpaper around the room. 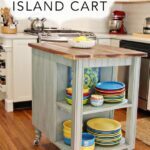 Talk about a budget makeover with impact! 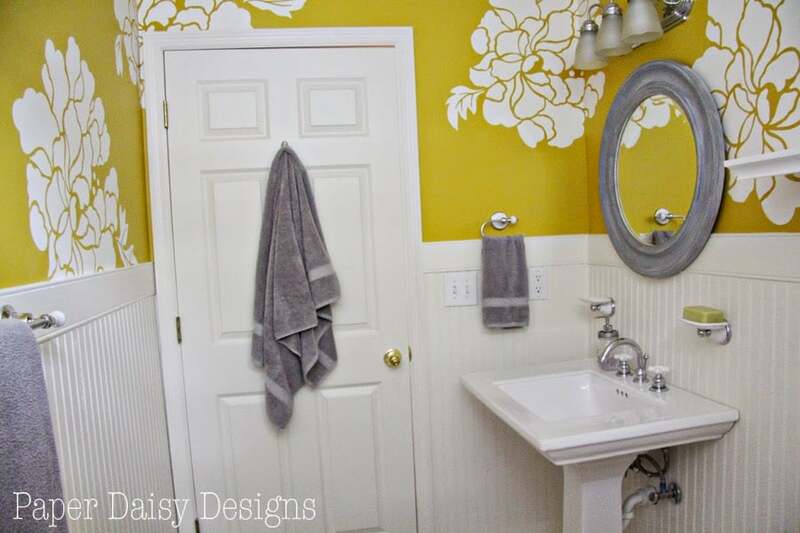 I must admit that when I first put the wallpaper color-matched paint on the wall, I started to doubt my choice, thinking it might be just a tad too bold. But now, I look for reasons to come down here and just smile. I hope the room gives a warm welcome to all our guests. 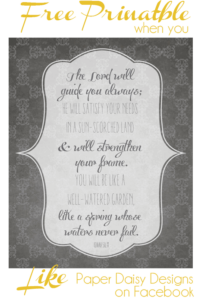 The finishing touch to the room is the word art I created of Isaiah 58:11. Feel free to download a copy for your own personal use. I only ask that you would “Like” Paper Daisy Designs on Facebook. Click on the image for the redirect to my Facebook Page where you can download it from the Printable Album. Here’s a source list for the known items in the room. Like I said, most of the bones were here for me to work with. 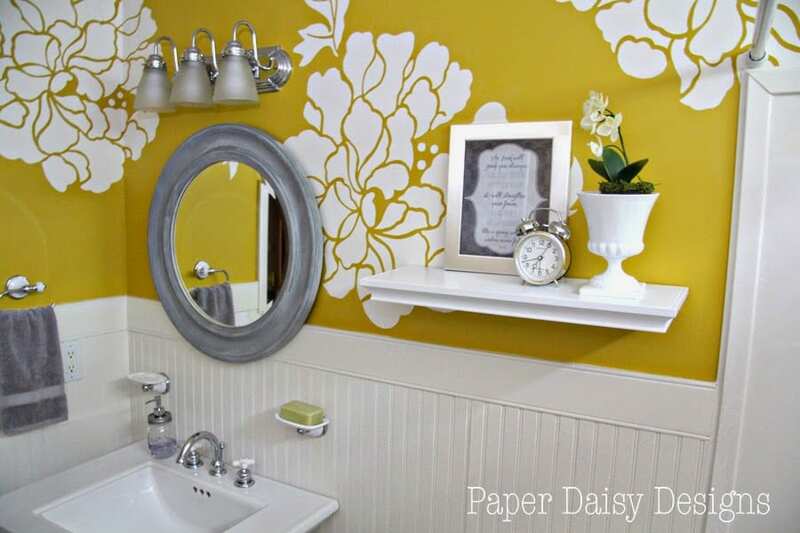 See how to use one roll of wallpaper to transform a room here. 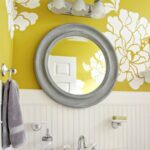 Just saw your gorgeous basement bathroom (linked from Pinterest) – and LOVE this adaptation of the original wallpaper design. What an original and much more impactful use of the design! Looking forward to following your blog now. Fantastic way to extend that gorgeous wallpaper! Really impressive project! I love your creativity! 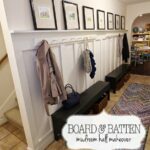 Where others would have threw in the towel you came up with a creative way to make the space even more beautiful! Plus it was so sweet of that gal to think of you when she wanted to trade the wallpaper in the first place! I&#39;m glad it has finally found a home. WOW! What a transformation! I love the punch of pattern and color! It looks great! Thanks for linking up to Show Me Saturdays! I love ho you made this bathroom so much brighter! It&#39;s so pretty! I have a basement bathroom and this is really inspiring me to bring in some light! 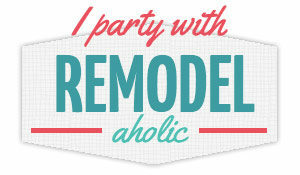 We loved this so much that we are doing the same makeover! 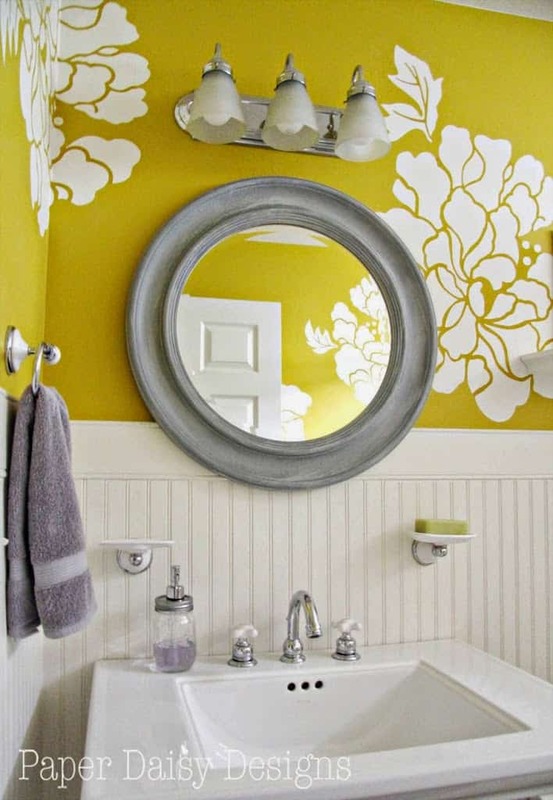 Thank you for sharing all that you did… Will you say what paint you found to match the color of the wallpaper? That’s fantastic! SO glad you like it enough to do your own. I just took a piece of the wallpaper to Sherwin Williams and had them color match it. Be sure to have them sample it on the actual paper to check to see if it’s a perfect match! 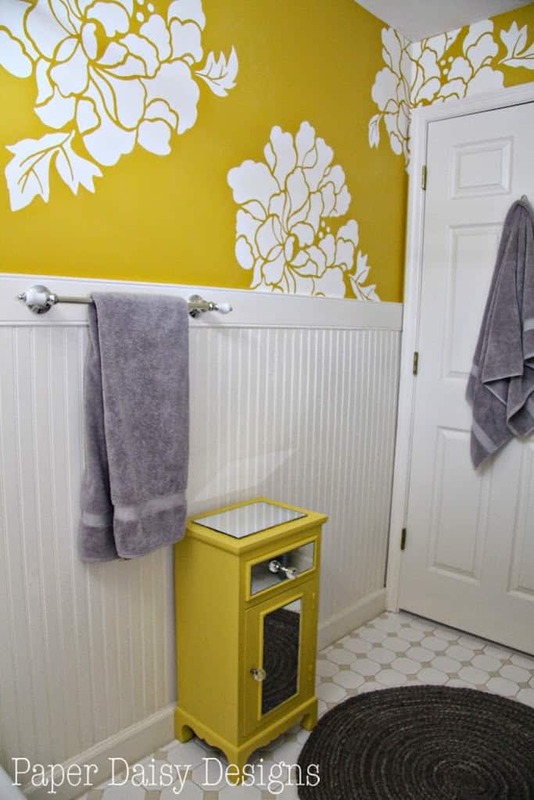 This is one of the most beautiful bathroom redo’s I’ve seen. I love your innovation in making the wallpaper go a long way. 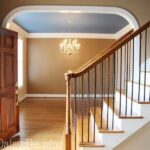 What is the name of the wall color?